Nothing pulls you closer to your sweetheart than winter weather. Chilly temperatures and sweet flurries of snow overhead mean it’s the perfect season for cozy dinners in intimate restaurant booths and long fireside talks with a warm cup of cider in hand. Castle Falls in Oklahoma City was modeled after a castle in Normandy, France. Whether looking for an afternoon out with your sweetheart or a memory-making weekend in a romantic locale you’ve yet to explore, find warmth this winter hand-in-hand with the one you love at one of these fabulous Oklahoma destinations. Dim lighting and intimate seating come together to make West perfect for pairs. Escape the cold by sipping a traditional cup of joe at this Oklahoma City gem or elevate the experience with a hot chocolate topped with a marshmallow made in-house. You’ll have to move in even closer to share the banana cake for two, featuring whipped peanut butter, panna cotta gelato and finished with a drizzle of Southern Comfort sauce and a sprinkle of shaved chocolate. After enjoying a treat at West, wander the halls of the Oklahoma City Museum of Art, stroll hand-in-hand along the canal that runs through the Bricktown Entertainment District or pop in and out of galleries within the nearby Paseo Arts District during a First Friday Gallery Walk. A coffee date at Trenchers Delicatessen in Tulsa is about so much more than just picking up a hot drink. Settle into this bustling deli and split a piping hot French press while keeping an eye on the constant churning out of fresh pastries in the sparkling case that stretches along the inside of the store. You and your date can fuel up from a hefty selection of homemade croissants, muffins, scones, pies and cookies before heading out into the cold to catch a movie at Tulsa’s historic Circle Cinema, a live show at Cain’s Ballroom or a game of bowling at Dust Bowl Lanes & Lounge. Located off the beaten path in Lawton, you and your date will find the ideal spot to settle in for a warm beverage at the Silver Spoon Kitchen & Bakeshop. The exposed brick walls, charming décor and live music four nights a week create the perfect backdrop for a cozy coffee date. Settle in to a comfy chair in the loft and sip a warm drink while sampling one of the incredible desserts this eatery has to offer. The gooey pecan pie cake and Vera Mae’s decadent cheesecake come highly recommended. After warming up over hot coffee and desserts, if your date is an outdoorsy guy or gal, take a short, scenic drive to Quartz Mountain Nature Park and the Wichita Mountains Wildlife Refuge. Join a seasonal eagle watch, or venture off on your own for winter hiking, birding and rock-hopping along serene nature trails. 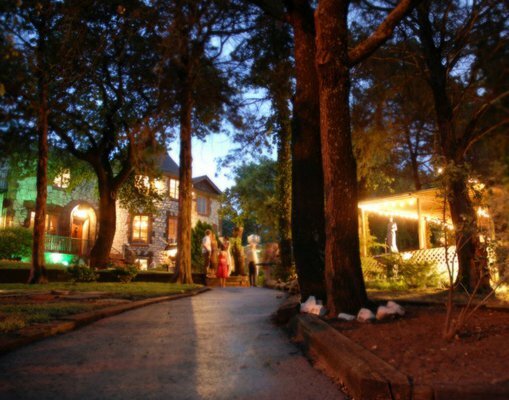 Escape to an authentic castle tucked away in five lush acres in Oklahoma City to impress your sweetheart with a five-course meal in a warm and inviting setting. Pass a cascading waterfall and towering oaks on this opulent property to settle into your seat in the charming dining room at Castle Falls for a meal you’ll never forget. Relax and take in the Old World charm while you savor each of the five delicious courses of authentic European cuisine in a private, luxurious setting. What could be more romantic than sharing a meal with the one you love while nestled close by a roaring fire? Live this dream at Vintage 22 in Ada, where you and your date will enjoy a piping hot, artisan pizza piled high with your favorite toppings. A seat near the patio fireplace provides the perfect opportunity to enjoy al fresco dining while staying warm. Complete the evening with a create-your-own cheesecake, where a crème brulee cheesecake can be topped with your choice of fresh berries, whipped cream, pecans and decadent sauces. Add a bottle of Oklahoma wine to the mix to make the night even more memorable. Request a booth at Tulsa’s Palace Café and enjoy quiet conversation and mouthwatering cuisine while tucked away from other diners. No cell phones are allowed here, so the focus of the evening will be on each other, where it belongs. Indulge in hearty fare like lobster ravioli and braised ribs or share a popular bento assortment, which includes small servings of chef-inspired treats like seared tuna, shrimp pot stickers and mini turkey burgers. Finish on a sweet note with fondue for two, which comes with marshmallows made in-house, fresh apples, caramel corn and gingersnap cookies dipped into European chocolate. Escape to the seclusion and luxury of The Canyon Inn at Medicine Rock Ranch in Lookeba and you’ll experience the ultimate romantic retreat. Step into this breathtaking property for a quiet getaway with your sweetheart surrounded by luxury amenities. Wake up to a homemade country breakfast served next to the inn’s beautiful rock fireplace then spend the day relaxing by the soothing waterfall and hiking the scenic surroundings before settling in to a long soak in your suite’s deep claw foot tub. Spark romance and make memories that will last a lifetime at the opulent Artesian Hotel, Casino & Spa in Sulphur. You and your date will never want to leave this romantic destination, and with so many on-site features, you may never need to leave. Enjoy shopping, dining, spa treatments and art gallery exhibits all on property. Whether taking a dip in the breathtaking indoor pool and hot tub or enjoying delicious room service from the comfort of your luxurious suite, a trip to The Artesian is the ideal spot to relax and reconnect. What could be more romantic than a quiet hot tub soak with your sweetheart surrounded by some of the most stunning views in the state? Beavers Bend State Park and Broken Bow Lake are great vacation destinations in winter and a stay at a Beavers Bend Getaways cabin puts you face-to-face with the scenic surroundings. Take your pick from dozens of cabins and you’ll enjoy soaks in private hot tubs, long chats nestled together in the glow of a fireplace and relaxing hikes through breathtaking scenery.